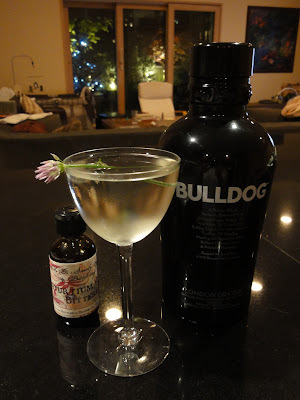 The challenge is to feature a cocktail that highlights a floral flavor profile or includes a floral derived ingredient, whether home-made or off the shelf. With the ever expanding catalogue of spirits (and the kitchen labs of home enthusiasts), there’s a whole host of directions for you to choose from – elderflower liqueur, creme de violette, chamomile infused gin, hibiscus grenadine, rosewater, lavender syrup – or to create. Hi there. Do you know where to buy the glass you've used for this delicious and pretty cocktail. Chive blossoms - great idea. But the glass - I must have it!